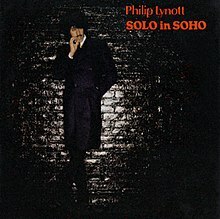 "Dear Miss Lonely Heart" / "Solo in Soho"
"King's Call" / "Ode to a Black Man"
Solo in Soho is the first solo album by Irish rock singer Philip Lynott, released while he was still in Thin Lizzy. Current and former Lizzy members guested on the album, including Scott Gorham, Brian Downey, Snowy White, and Gary Moore. Brian Robertson also contributed to the writing of "Girls". Dire Straits frontman Mark Knopfler plays on "King's Call", a lament to Elvis Presley. Huey Lewis plays harmonica on "Tattoo (Giving It All Up for Love)" and "Ode to a Black Man". Lewis later covered the former on 1982 Huey Lewis and the News album, Picture This. "Yellow Pearl" was released as a single in two remixed versions - the first of these being later used as the theme tune from 1981–1986 for the British music TV programme Top of the Pops. This version was later included on Lynott's second solo album The Philip Lynott Album. All songs by Philip Lynott, except where noted. ^ Rivadavia, Eduardo. "Phil Lynott - Solo in Soho". AllMusic. All Media Network. Retrieved 2018-06-29. ^ Popoff, Martin (1 November 2005). The Collector's Guide to Heavy Metal: Volume 2: The Eighties. Burlington, Ontario, Canada: Collector's Guide Publishing. p. 203. ISBN 978-1-894959-31-5. ^ Graham, Bill (25 April 1980). "Solo in Soho". Hot Press. Vol. 3 no. 21. Retrieved 2018-06-29. ^ Hepworth, David (15 May 1980). "Albums - Phil Lynott: Solo in Soho". Smash Hits. Vol. 2 no. 10. p. 31. Retrieved 2018-06-29. ^ "Phil Lynott - Solo in Soho (Album)". Swedishcharts.com. Media Control Charts. Retrieved 29 June 2018. ^ "Phil Lynott - Solo in Soho (Album)". Norwegiancharts.com. Media Control Charts. Retrieved 29 June 2018. ^ a b c d "Phil Lynott Official Charts". Official Charts Company. Retrieved 29 June 2018. ^ a b c "The Irish Cahrts: search for Philip Lynott". Irish Recorded Music Association. Retrieved 29 June 2018. ^ "Philip Lynott - King's Call". Hitparade.ch (in Dutch). Media Control Charts. Retrieved 29 June 2018. This page was last edited on 31 January 2019, at 04:28 (UTC).